I *will* get air conditioning if it kills me! I have a temporary roommate. Which means that I have given up my bedroom in favor of sleeping in a chair in my prayer room. The window there is very small. And it does not raise up very high. 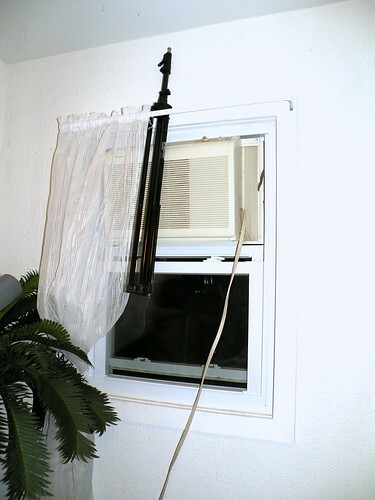 So the window air conditioner that I have is too tall to fit nicely in the bottom part of the window. But, you all know how stubborn I am. It is 11 pm, and my thermostat on my house says 82.5 degrees F, and I am itchy from this rash and poison ivy or whatever it is that is plaguing my skin and I am having NONE OF IT! 🙂 I am determined to have air conditioning. So, I try and move all the window panes to the bottom instead of to the top and putting the air conditioner on the top part of the window. Never mind that I am short of breath and being worked up for a cardiac condition. I am lifting heavy things over my head because I am a) stubborn and b) dumb. Okay, it mostly fits in there. It’s a little tall still, so it is not going to pitch backwards out of the house. The only question is if it going to pitch forward and fall into the house and on my head. Holding up my curtains is this flimsy, cheap metal rod. I can stick something in there, wedge it between the rod and the air conditioner, to hold it in place. But what?